Charming Bungalow circa 1928 featuring old world charm and modern amenities! 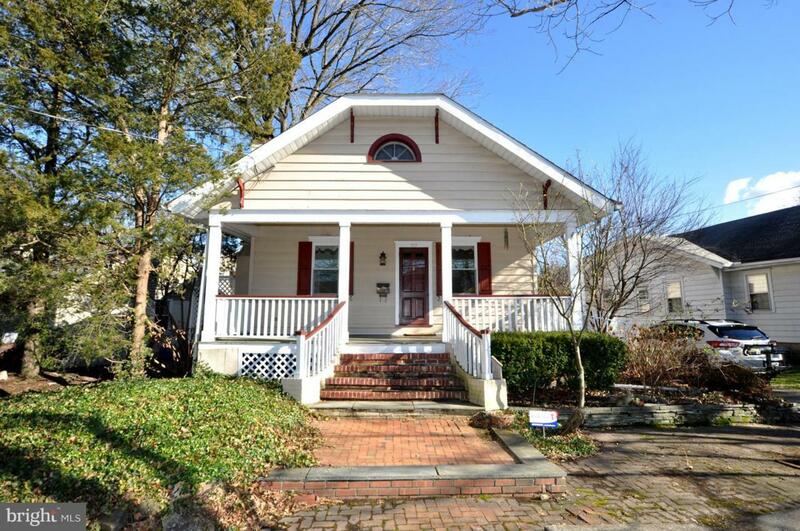 An architectural gem within walking distance to downtown Haddonfield shopping and dining. Wide plank wood floors, wooden framed beams, exposed brick and stained glass windows adorn this home. Living Room boasts a brick fireplace and the kitchen has been updated with new cabinetry, countertops and farmhouse sink. The bathroom has been updated with new cabinets and corian vanity with tile flooring and newer shower/tub combo. The main bedroom has beadboard wainscoting and the 2nd bedroom has been converted to a dressing room/laundry area, but can easily be converted back. Upstairs is a large finished area with ample closet space which can easily be a 3rd bedroom. There is also a catwalk overlooking the main floor and leads to a bonus room . There is a full basement which has a laundry hookup as well and newer furnace and HVAC. Relax on your backyard deck, which steps down to paver patio, detached garage and driveway. Walk to town and enjoy all downtown Haddonfield has to offer as well as theTop Rated School District! This home is being conveyed strictly as is with buyer responsible for CO and any repairs requested from township, home or lender inspections. Priced 20k below appraised value! !